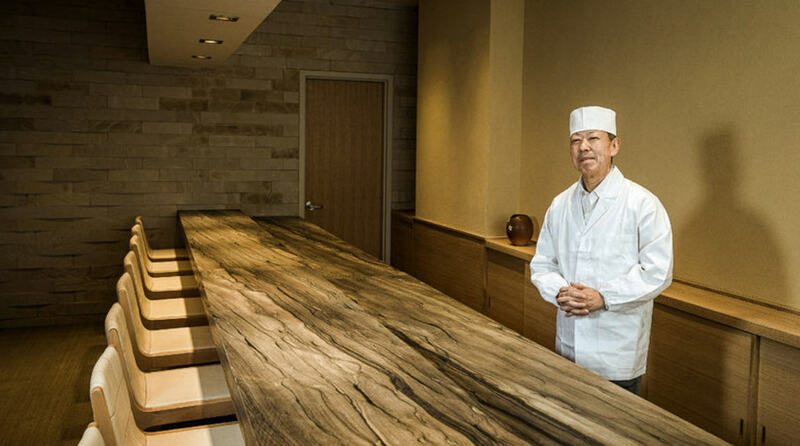 I was chatting with an Instagram pal just a couple months ago, and he mentioned Chef Eiji Ichimura’s new location. I was like, what are you talking about? He moved? I googled, and Chef was in fact in Tribeca, so I thought nothing of it. It wasn’t until an hour prior to our reservation, when I was googling the address, did I realize that chef really did move! The space – I am sorry, but I have to say, I liked the old space better. Brushstroke had the high ceilings, the brighter lighting, the floor to ceiling windows, the décor, the “book-built” walls, and the adorable embedded miniature dioramas. Space was beautiful. The new space is rather dull. The waiting area is quite nice, bright and airy, with several cushioned benches for seating, and a larger than life vase with the real flowers. The room where they seat you for the meal is very different though. It’s 100% enclosed, walls, though textured, is 100% bare, and talk about monochrome! Everything is beige/khaki. When you’re in a windowless room, something is required. Some color or some art, anything. It’s more comfortable! It’s not nearly as stuffy as Brushstroke! You won’t feel a need to dress up, wear heels, or be “made up”, which is nice. The staff was super attentive, and very friendly, which for whatever reason, is no longer a guarantee despite what you are paying. Only real gripe is – not sure if it’s the acoustics in this room or if people have no common decency anymore, and believes everyone should hear their conversation, but out of 8 other patrons, we heard the convos of 6. Aren’t people obnoxious? I don’t have “proof”, a photo diary of our meal, but I have a really good memory. 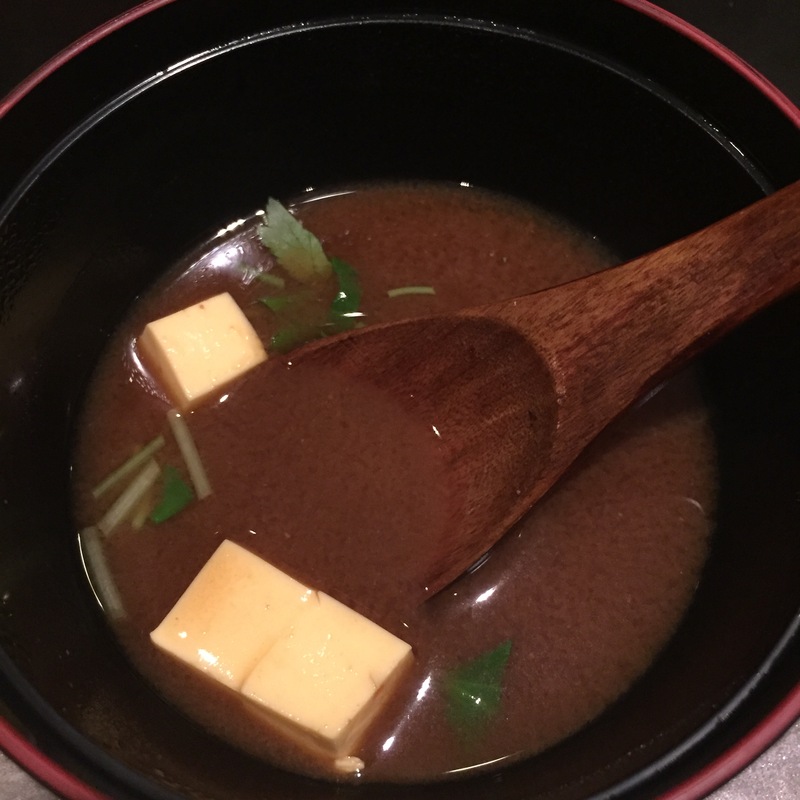 From what I recall, the meal was started with a number of cooked dishes, and then went heavily Tuna oriented, which I like, but it was so much, that I felt like I had mercury withdrawal after. I also recall it being A LOT of food in general. I’m a small girl, but I can EAT. Boyfriend is over a foot taller, and BUILT, but I can easily out-eat him. I remember having to tap out, because it was just too much. Today’s meal was had a much better “distribution” of fish categories, and only a few cooked servings, which I appreciate. $300 bucks for a 20 course meal comes out to be about $15 per piece, a bit steep if you ask me. The cost of alcohol for some reason, has gone down significantly! This is great for drinkers like us, it actually levels the cost back to what it used to be. But for those that really just go for the food, and have at most a beer or two, your bottom line is hit pretty hard. 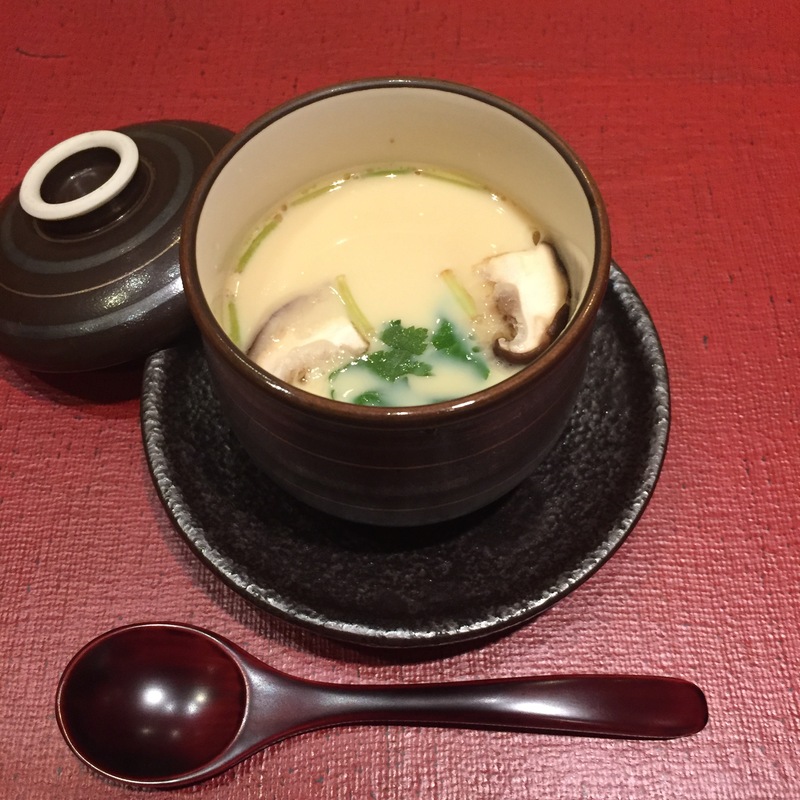 AOYAGI (Round orange/surf clam) – with white miso dressing and spring onions. There was a LOT of onion though, a bit spicier than I’d prefer, but overall, still great!!! 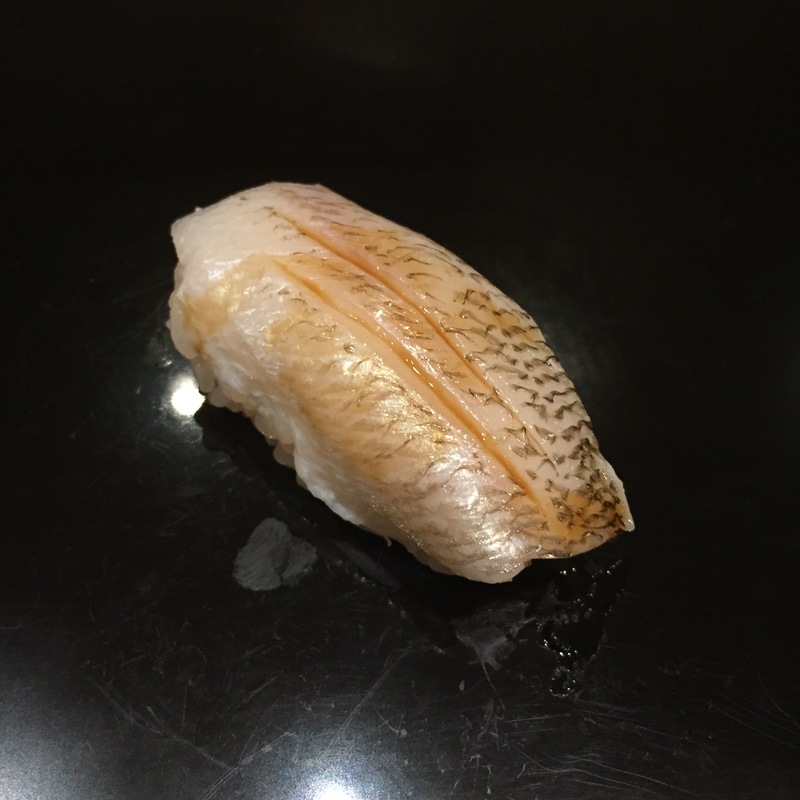 HOTARU IKA (Firefly squid) – Not a fan. I love the raw form, but this deep fried version was really fishy. 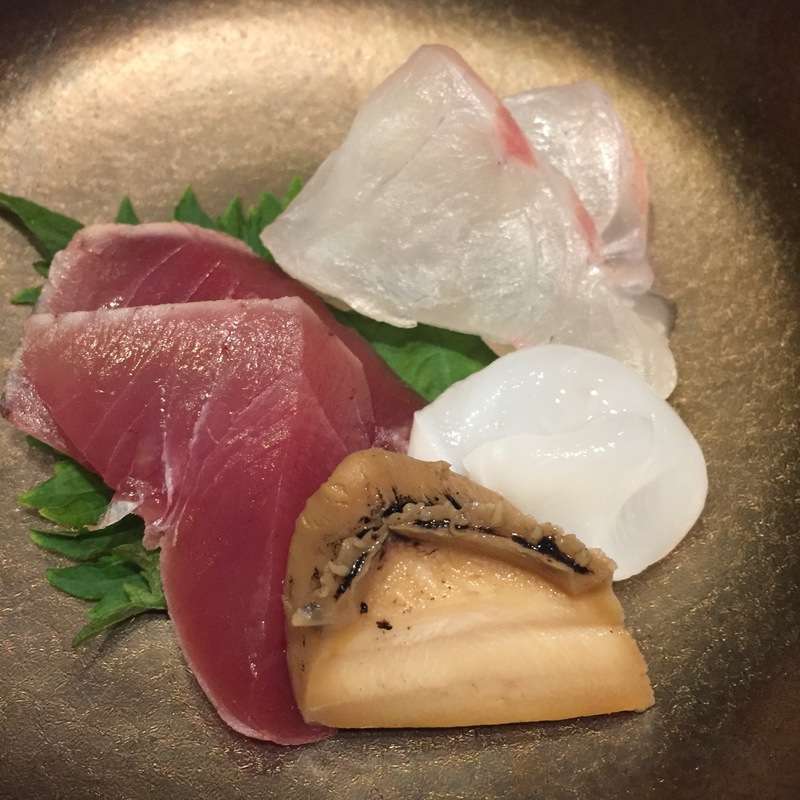 MADAI (Seabream) Sashimi – This was amaze balls! Beautiful save from the mediocre KATSUO. 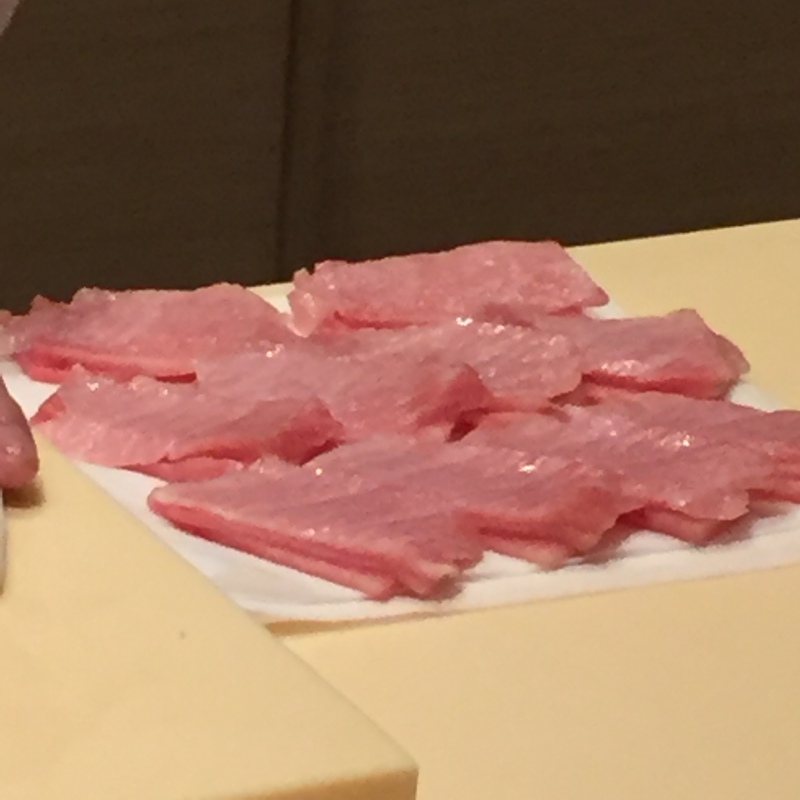 NAMADAKO (Live octopus) Sashimi – This is one of the least chewy cuts of NAMADAKO I’ve ever had. So tender, so delicious! 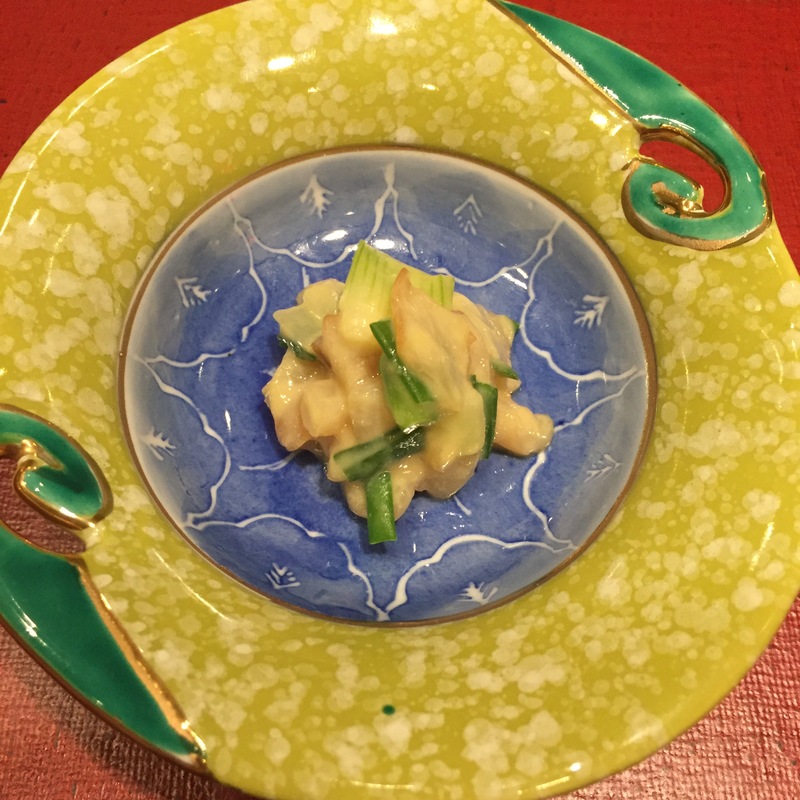 TOKOBUSHI (Abalone) Sashimi – TOKOBUSHI from Seattle simmered in sake. For a simmered item, this was just the right chew, and highly commendable! 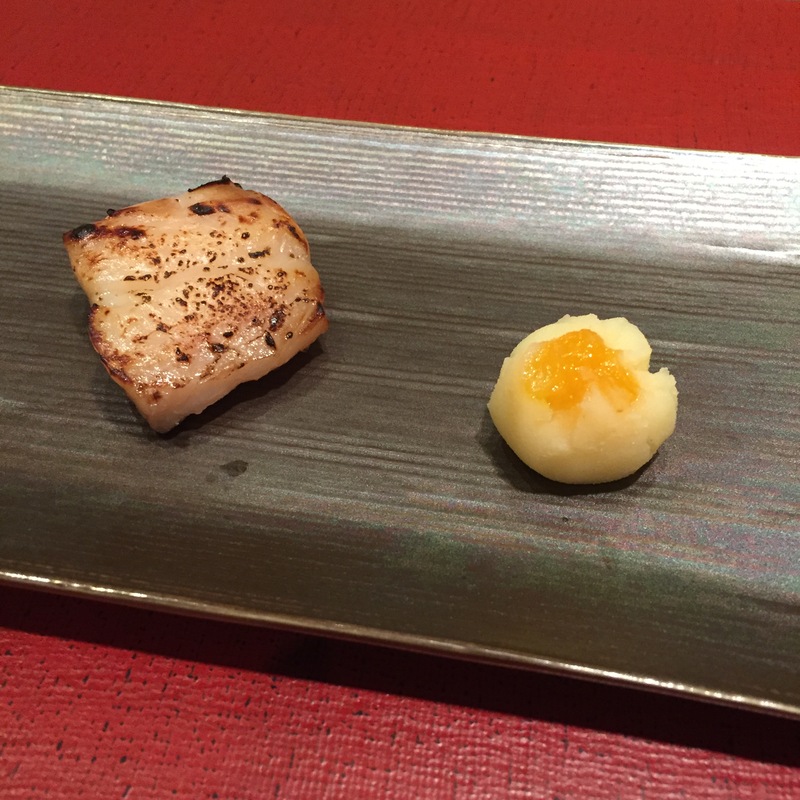 Tile fish marinated with miso – mashed potato with apricot purée. Very good, but so happy that this was the last cooked serving of the night! 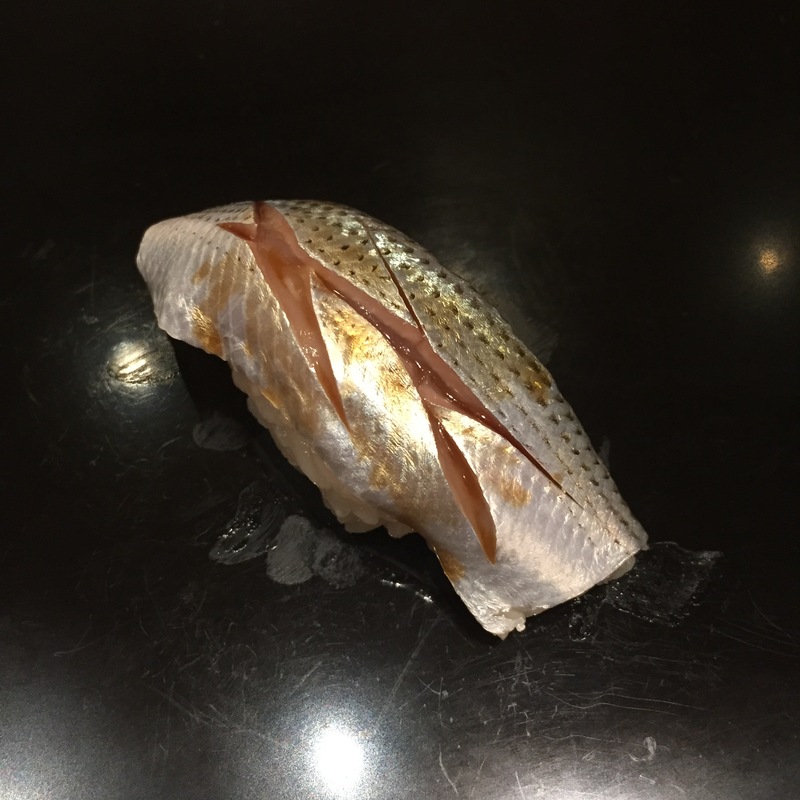 KINMEDAI (Golden eye snapper) – Lovely!!! Chef’s rice is FANTASTIC! 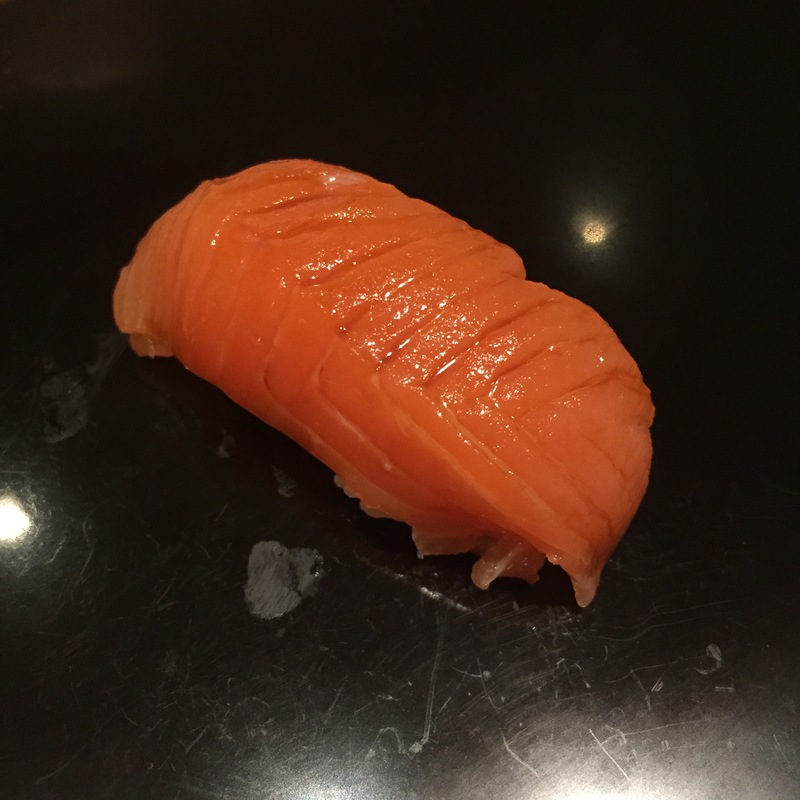 SAKURA-MASU (Cherry Salmon from Hokkaido) – Usually not a fan, but this one was delish! 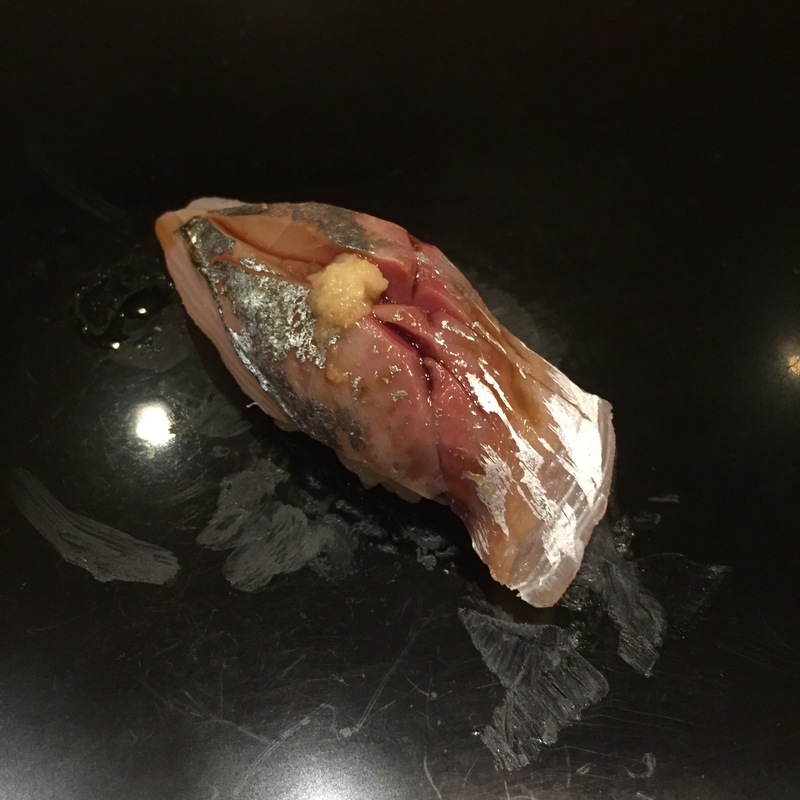 SAWARA (Spanish mackerel) – I typically don’t love this fish, but this was very good! 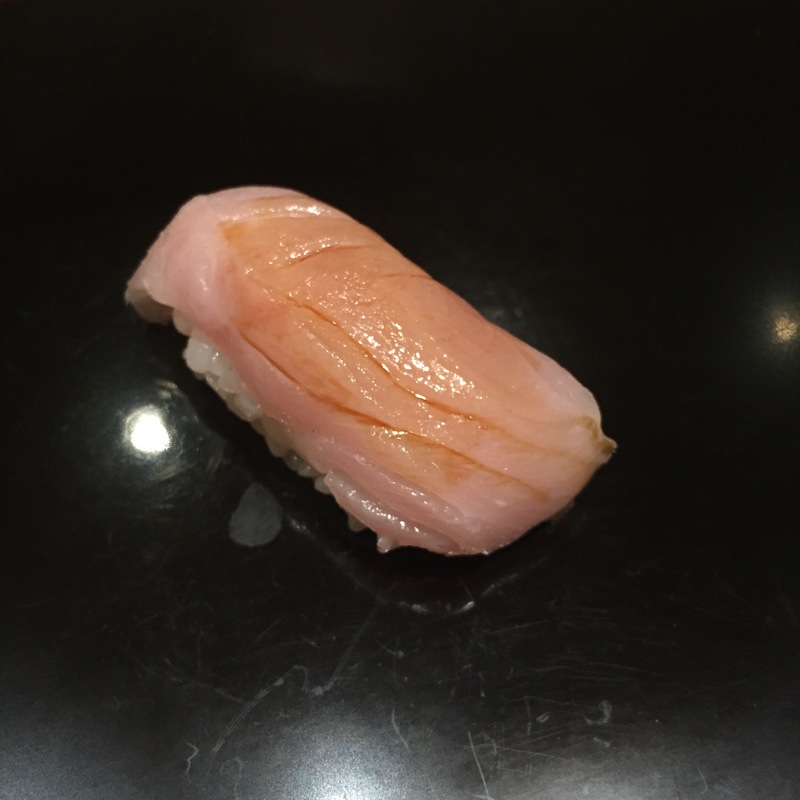 SHIMA AJI (Striped Jack) – thank goodness, this one was very good. 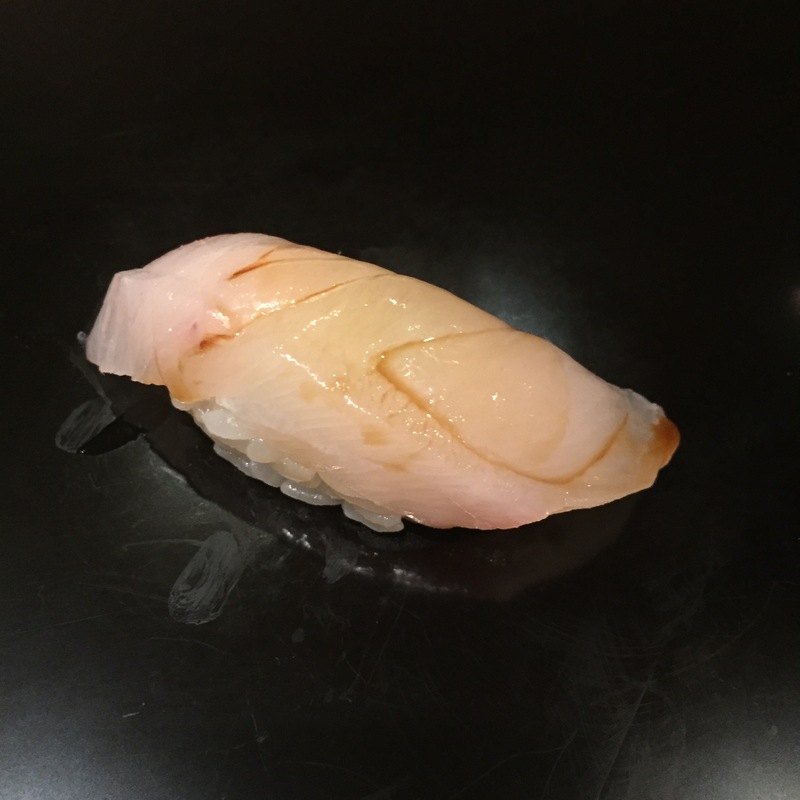 MIRUGAI (Giant clam) – Super crunch! 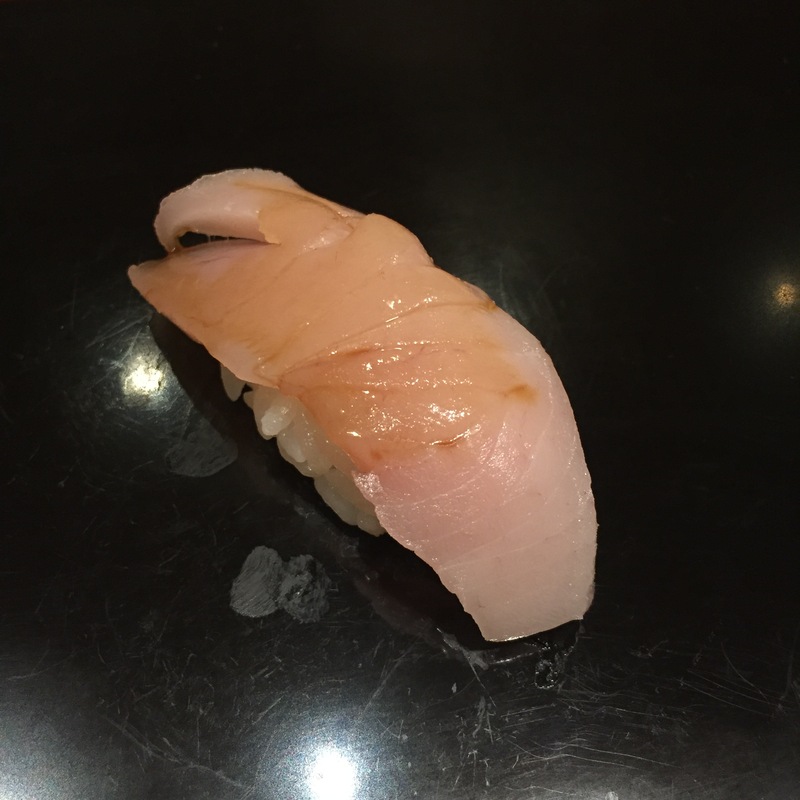 This was a delectable piece of fish, with just the right ocean tinge. One of the highlights of the night thus far! 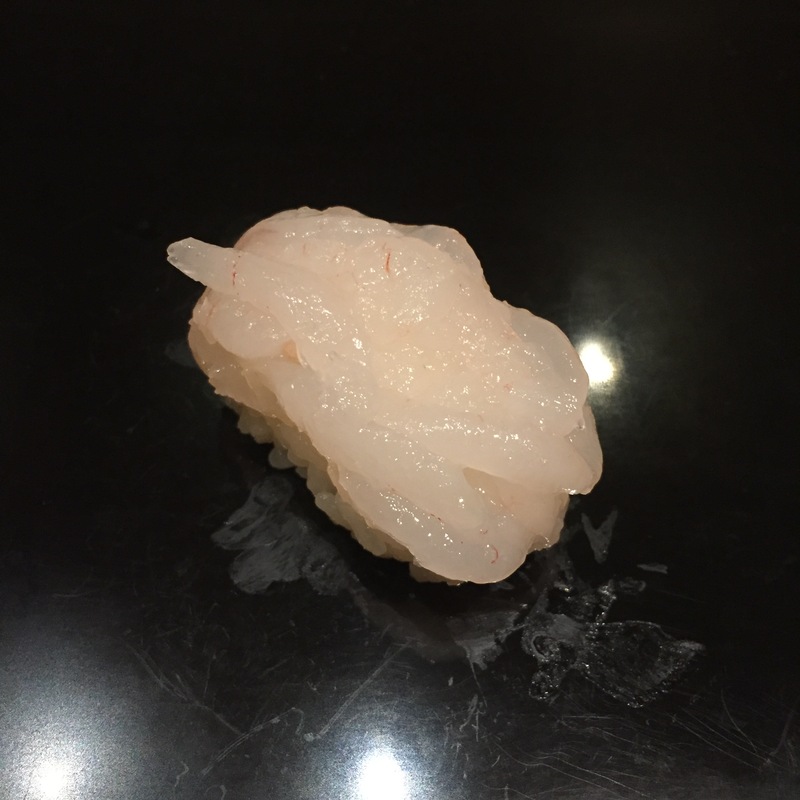 SHIRO EBI (Sweet white shrimp) – Another beautiful piece. Perfect! AKAMI ZUKE – Just as I remembered, Chef Ichimura does Tunas impeccably well. 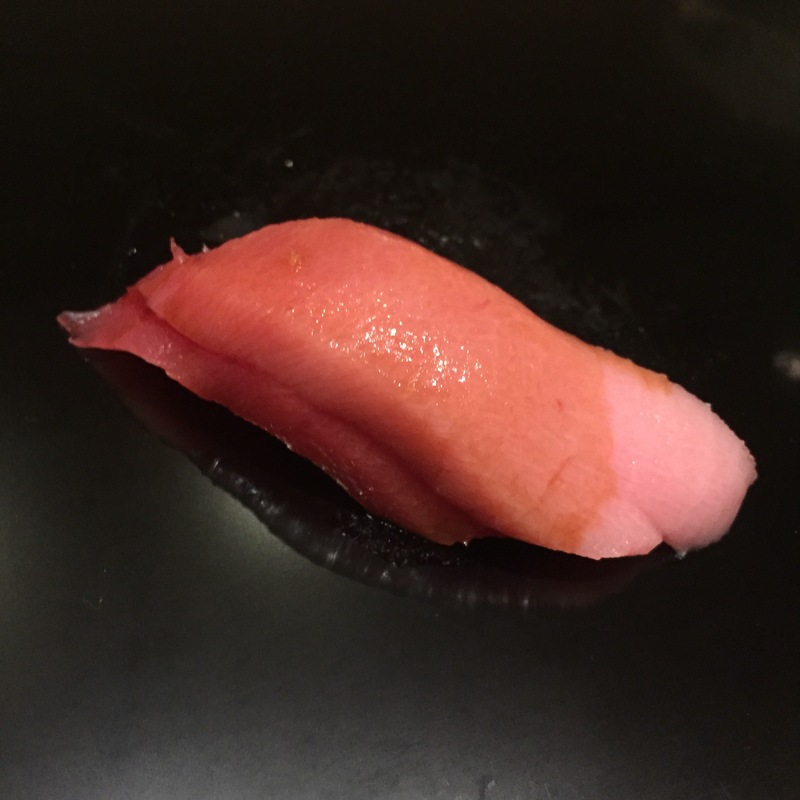 We watched him re-marinate the AKAMI at the very start of the meal, but he waited till now to serve. It was really, very good. 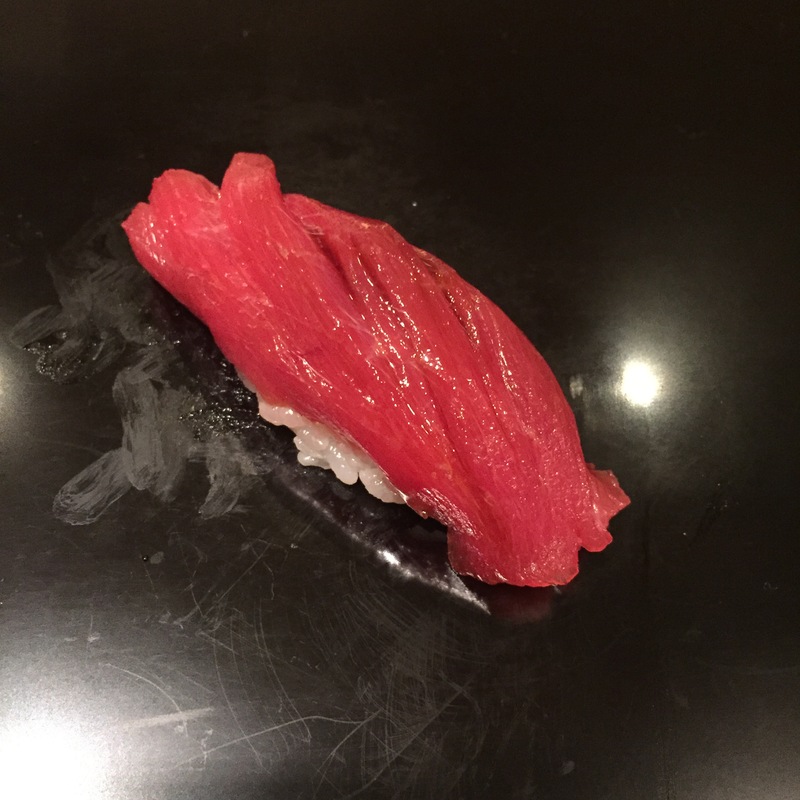 CHUTORO (medium fatty tuna) – Back to the Tunas, what Chef is known for. Chef’s TOROs just melts in your mouth, and does not leave that nasty film of oil. How he does it is beyond me! This was really fantastic. 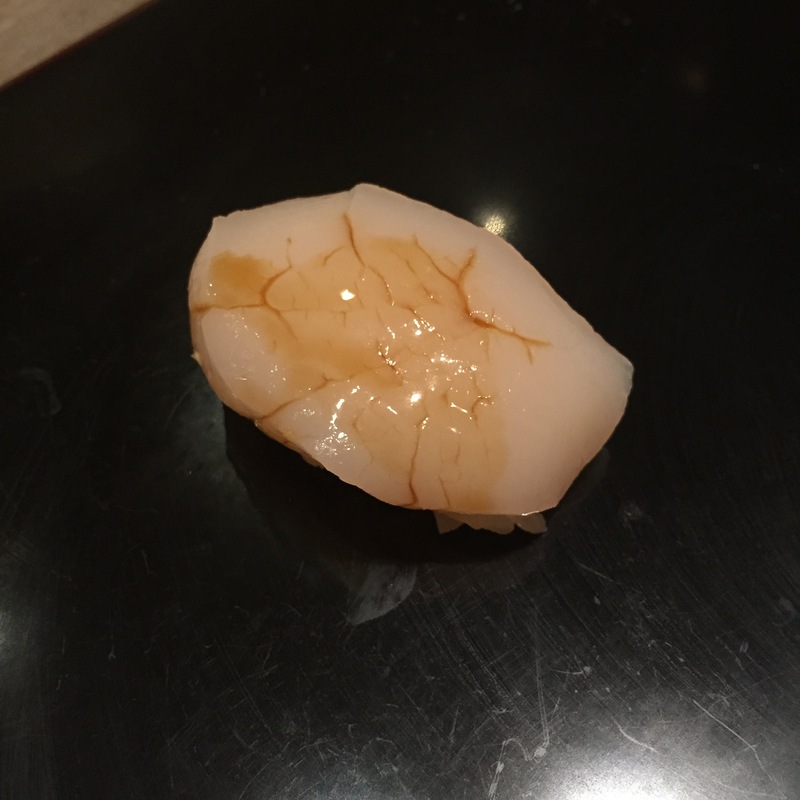 HOTATE (Scallop) – Beautiful cut, with the perfect taste of the sea, and a lovely crunch! 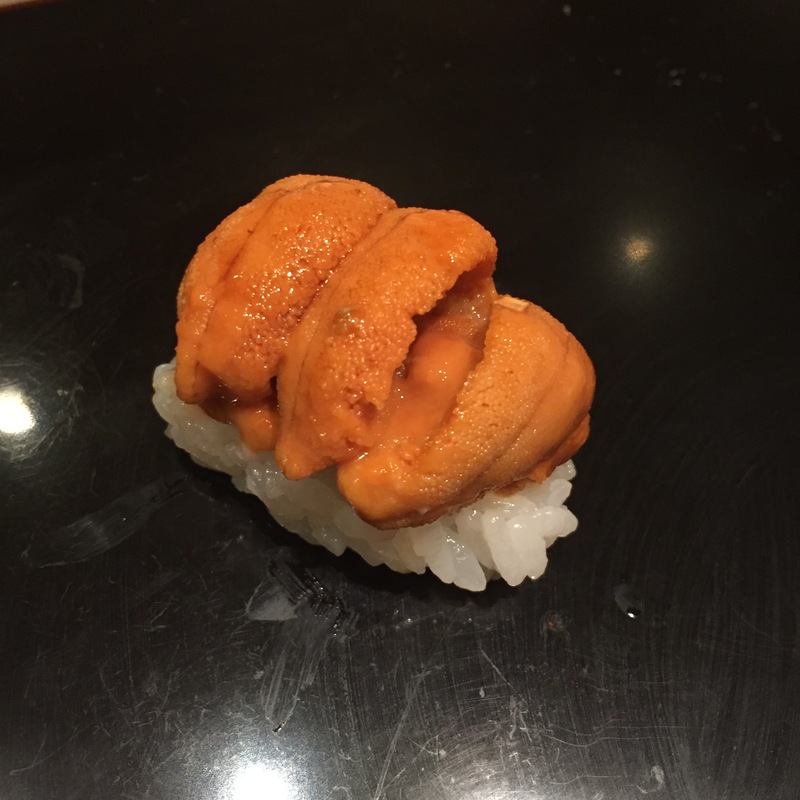 HOKKAIDO UNI – There’s been a serious shortage of UNI this year. 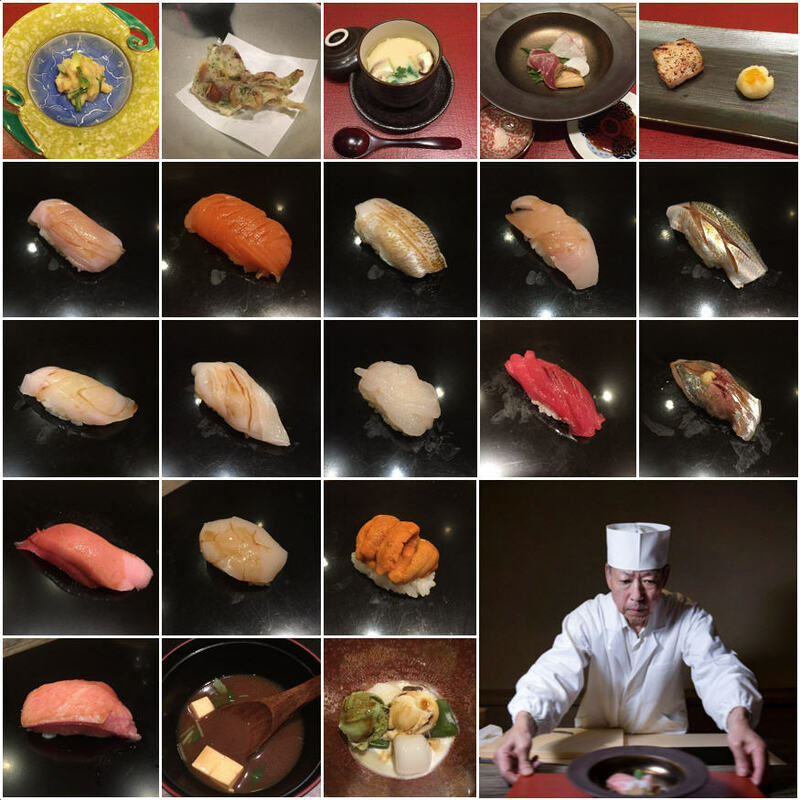 Last year, every joe-some restaurant will serve decent UNI. This year, you are only guaranteed when you go to the top tier restaurants, so sad. This was delish! 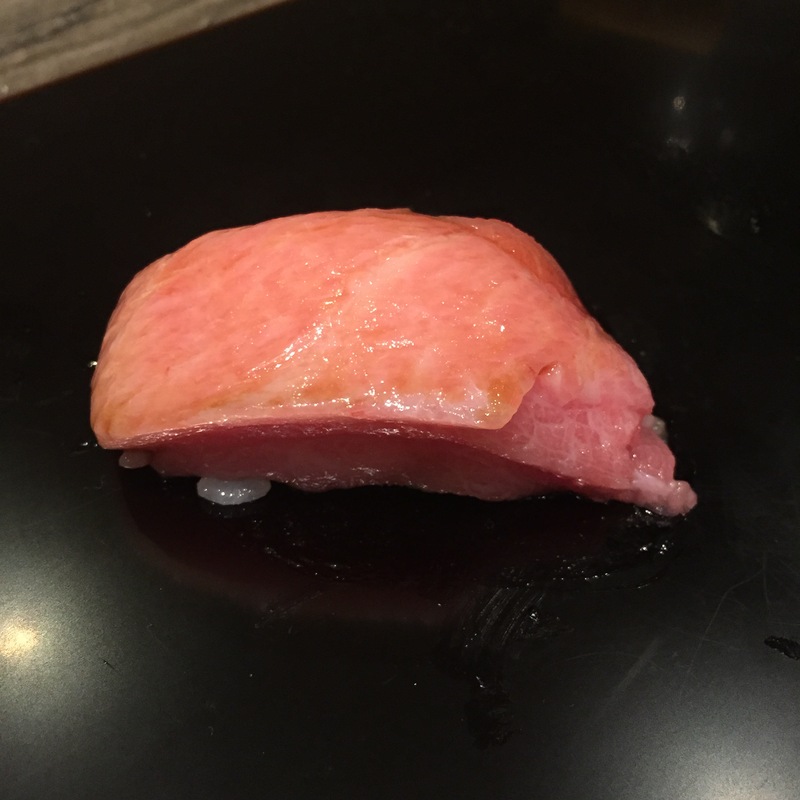 OTORO (super fatty tuna) – Another beautiful Chef Ichimura creation, three layers of incredible super fatty tuna that has zero veins, and a no funky aftertaste, no nasty oily film in your mouth. He’s fantastic. 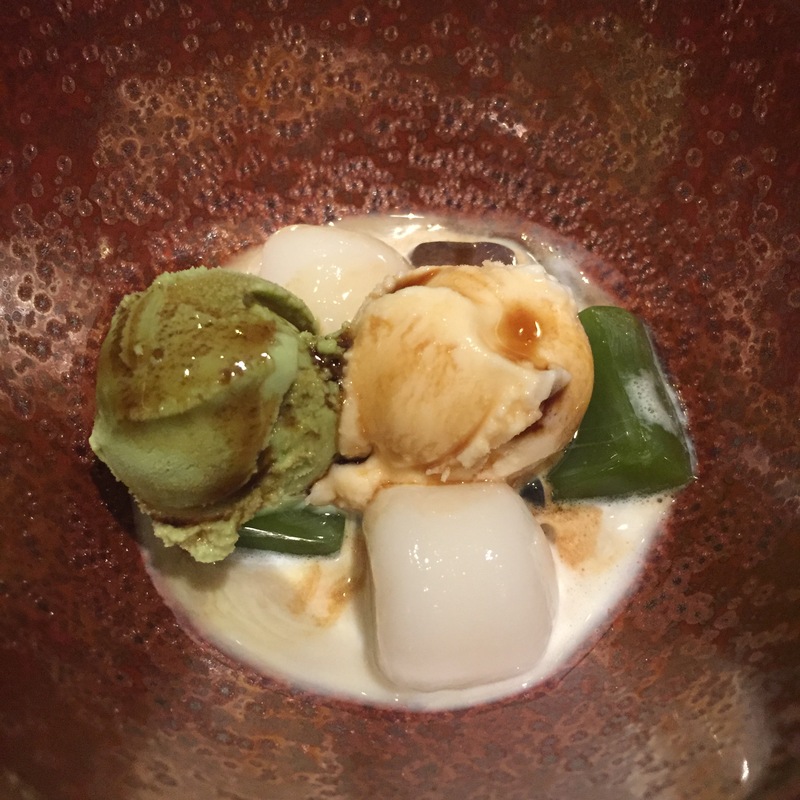 Dessert – I’m not a huge fan of sweets, so you have to be really incredible to wow me. This was just ok. This was a GREAT meal, but expensive. 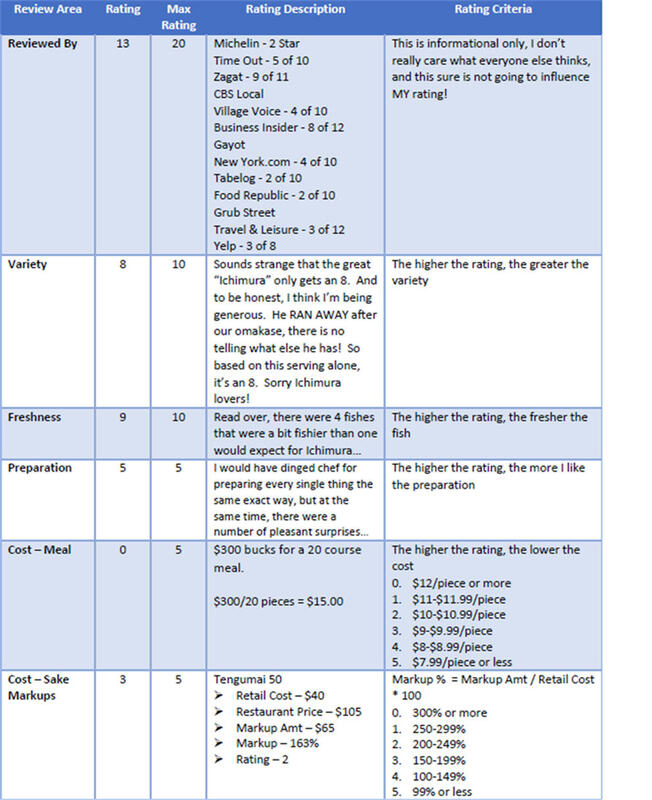 Boyfriend doesn’t like to admit it, but we actually spent less now that the meal is $300 per person as opposed to the old $195 per person. Reason is two-fold. Reason one, the alcohol, we usually drink a solid 2 bottles of sake. Brushstroke only carries the super pricey Junmai Daiginjo, like $250 per bottle, but Ichimura would carry those that run about $100. Reason two, and the real “bargain”, is that new Ichimura does not accept tips. 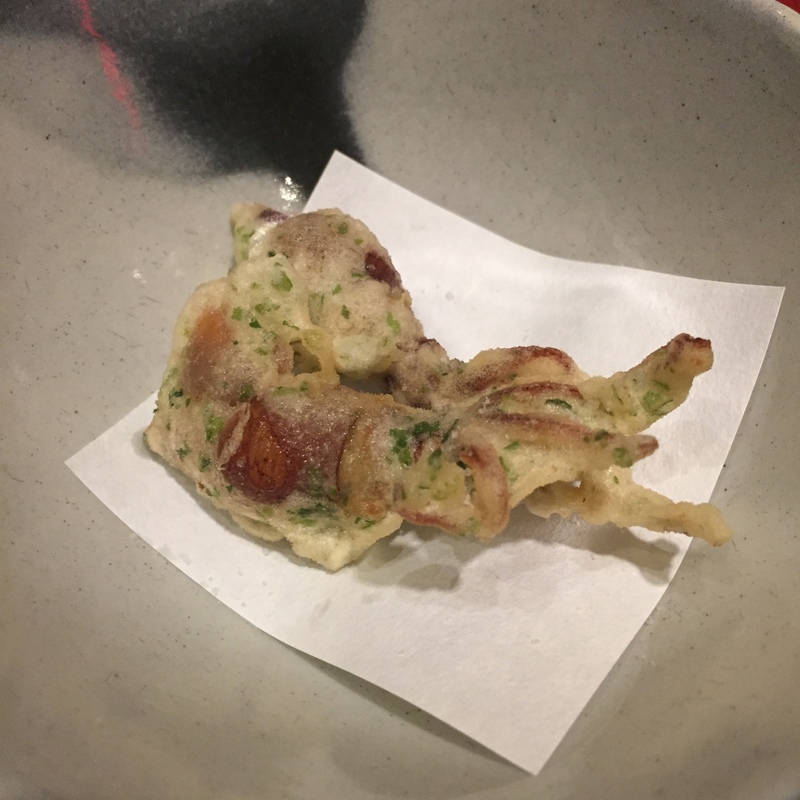 I hate comparing, but if you are ok spending $300 per person, AND you don’t drink much, I would go to Ginza Onodera instead, who also does not accept tips. Note that Ginza Onodera has a very healthy markup on sake though, so drinkers beware!